Here is a typical example of Block Paving: - Please mouse over the before image to view the result after. 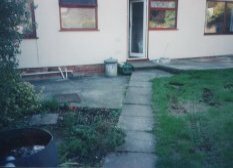 First image, shows an old & worn patio area which is has become unsightly and of little use to the occupants. Image on mouse over, after our recommendations and design, showing a very attractive area which can be enjoyed by the whole family. 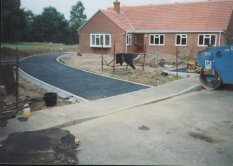 The process of replacing existing types of paving / slabs to modern block paving can be seen by clicking the picture of old path / patio area. 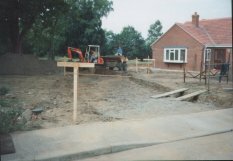 Here is a typical start to a project commencing with setting up of levels and excavating of top surface area to required depth. 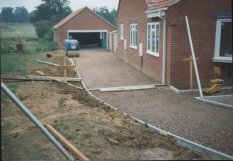 Some sites may require the removal of soil off site or moved to another location to be used for landscaping at a later date. 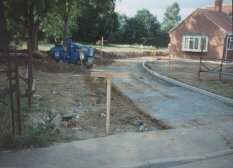 After excavating has been completed and compacted, the next stage of the project is to form a retaining edge, using either concrete edging kerbs, pavier blocks or pre-treated timber. In this example we have used concrete edgings. After completion of Stage 3, we now apply the base course depending on our clients specifications. For the contract illustrated we have used base course tarmac in preparation for wearing course tarmac (finished surface), As an alternative, a 50mm layer of compacted sharp sand would be used as the base course for Block Paving to complete the project. Before- Mouse over to see after block paving had been laid.